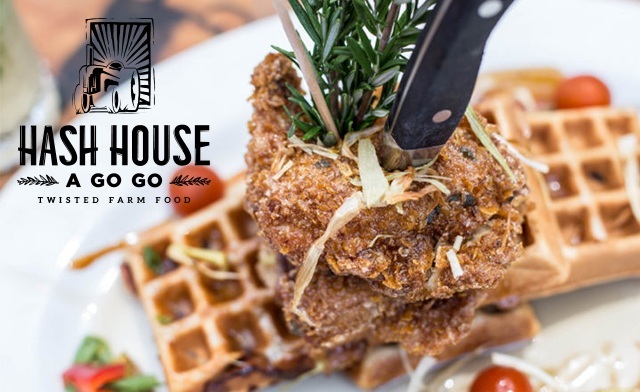 Order something — anything — from Hash House A Go Go’s creative menu, and you will experience something highly unusual when your dish arrives. Shock and Awe! Nearly every dish, from the signature Fried Chicken and Waffles to the Stuffed Burgers and Roasted Chicken Pot Pie, looks and tastes like a party on your plate. This award winning chain keeps the fun in food while pulling from the experiences of farm fresh agriculture, live stock, and old recipes with a twist. Buy a $25 gift certificate for just $15 with this deal, and enjoy festive eating for breakfast, brunch, lunch or dinner. A festival of farm fresh agriculture and livestock on every plate! Award-winning breakfasts, brunches, lunches, and dinners. Gift certificates will be mailed within 5 business days. Not valid for alcohol or gratuity.